Below are some images from the Harlem Courthouse jail web page. Three dozen New York historians, academicians, graduate students, genealogists and serious researchers participated in the first-ever history tour of Hart Island and the Harlem Courthouse jail Thursday, April 27. 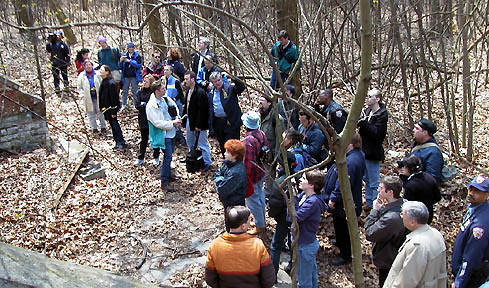 Some tour participants stand amid the Hart Island overgrowth as Capt. Eugene Ruppert (center) points out features of an abandoned building. Available to answer questions are veteran COs Thomas O'Connor and Samuel Perry, visible in lower right corner. Both with NYC DOC 41 years, they served on Hart when it still housed inmates. Partially visible on the left, top and bottom, are the building's arching stone front stairways. Organized by the New York Correction History Society (NYCHS), the tour was conducted through the good offices of the New York City Dept. of Correction (NYC DOC) and in coordination with the City University of New York Americanist Group, a part of the New York Metro Chapter of the American Studies Association. NYCHS initiated the event to promote the academic community's interest in recovery and preservation of correction history in New York. Helpful in arranging the Harlem jail portion of the tour were the New York City Department of Citywide Administrative Services, the New York State Office of Court Administration and the Harlem Community Justice Center whose offices are located there. The top of the arching stone front stairways features a center stone naming the three Commissioners who headed the NYC Department of Public Charity and Correction when the now-abandoned Hart Island building was erected in 1883. The all-day event began at 9 A.M. when participants gathered at NYC DOC hq in Manhattan's Tribeca section, received background information kits, viewed a 77-image orientation slideshow and then boarded the tour bus. At the City Island slip for the Hart Island ferry, they were greeted by Correction Captain Eugene Ruppert, veteran head of the Potter's Field burial detail; City Island historian and nautical museum curator Virgina Gallagher, and Correction Officers Samuel Perry and Thomas O'Connor, the only officers still with NYC DOC who worked on Hart Island when inmates were housed there. Both joined the Department in 1959. Near-century old records recently discovered in a long-forgotten attic storage area of the 1892 courthouse jail. at the Civil War's end. On Hart, the tour group visited the Civil War Union soldiers and sailors' burial site and its 1877 monument as well as the site of the Army Nike Ajax missiles poised at the ready on the island during part of the Cold War. 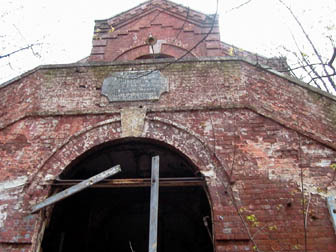 The visitors saw dozens of abandoned structures from the 19th century and later eras when the island housed various classifications of inmates and patients. The group viewed Potter's Field and the massive 30-foot high Peace monument build in 1948 by inmates for the unbefriended and unclaimed dead buried on the island. Throughout the island tour, Capt. Ruppert, COs Perry and O'Connor and curator Gallager provided commentary and answered questions. On the return from Hart, she opened the doors of the City Island nautical museum (usually closed weekdays) so that the group could view the exhibits linking the histories of the two islands. 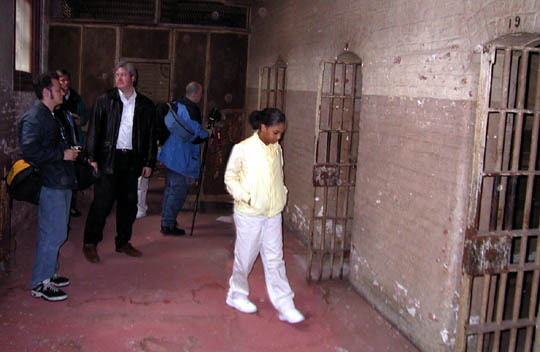 Tour participants view cells in the 1892 Harlem Courthouse jail. After a quick lunch at one of City Island's famed seaford restaurants, the group reboarded the bus that then headed to the Harlem jail where participants were greeted and escorted by David Bedrin, the Harlem Community Justice Center's facility and fiscal administrator. He led them on a tour of the 1892 courthouse's restored courtrooms (featuring partially restored WPA murals) and the unrestored 40-cell multi-tiered jail. 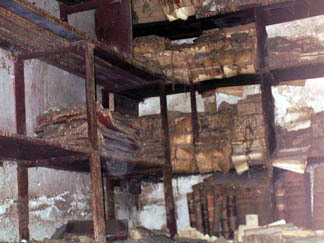 One highlight of the visit was a peek at the recently discovered near-century old court and jail records bundled, shelved but damaged by dampness and pigeons in a long-forgotten attic storage area accessible only by ladder. 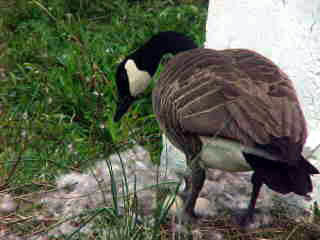 "New Life in Potter's Field" is the title given this scene of a goose tending its eggs nestled near the white stone marker designating the location of a Hart Island burial plot for 150 interments. The photo was snapped by tour participant Joan Koster-Morales, Ashland town historian in Greene County, NY. For more images taken by tour participants, visit Photo Album starter page. Before concluding the visit, tour members were thanked for their participation by Thomas McCarthy, NYCHS general secretary and NYC DOC director of historical services. He explained that the tour was just the latest in a series of activities set in motion by an initiative launched under the previous NYC Correction Commissioner, Michael P. Jacobson, and expanded under the current Commissioner, Bernard B. Kerik. The initiative seeks to recover, preserve and promote correction history in New York with the help and participation of the academic community. Professor Jacobson, now with John Jay College of Criminal Justice and the CUNY Graduate Center, is president of the New York Correction History Society; Commissioner Kerik, its board chairman.